RSM is offering a unique opportunity for a Supervisor to join our growing Technology Services Consulting Practice. 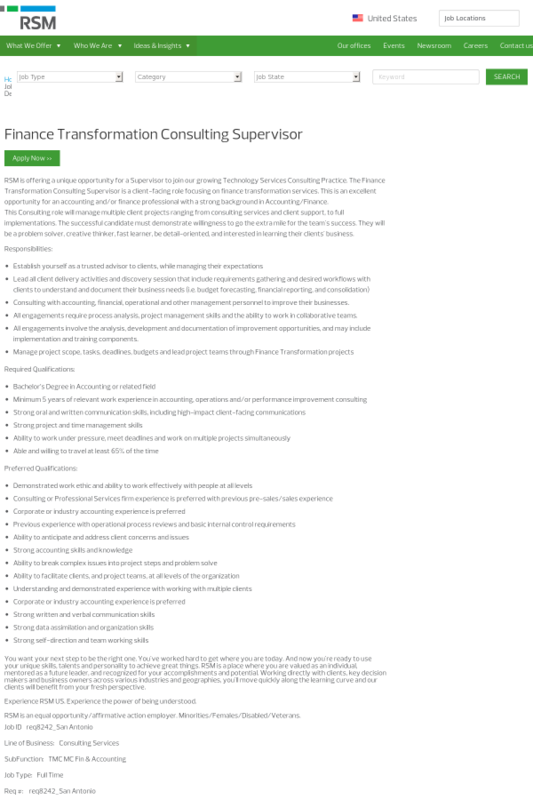 The Finance Transformation Consulting Supervisor is a client-facing role focusing on finance transformation services. This is an excellent opportunity for an accounting and/or finance professional with a strong background in Accounting/Finance. This Consulting role will manage multiple client projects ranging from consulting services and client support, to full implementations. The successful candidate must demonstrate willingness to go the extra mile for the team's success. They will be a problem solver, creative thinker, fast learner, be detail-oriented, and interested in learning their clients' business. Consulting with accounting, financial, operational and other management personnel to improve their businesses. All engagements require process analysis, project management skills and the ability to work in collaborative teams. All engagements involve the analysis, development and documentation of improvement opportunities, and may include implementation and training components. Confirmed 10 hours ago. Posted 28 days ago.